The service was launched in late April this year and the number of subscribers topped 860,000 as of Wednesday this week, the company said. DCMX provides ¥10,000 (US$83.80) of instant credit to users of newer phones that are compatible with DoCoMo’s osaifu keitai (mobile wallet) service. Upon application users can get up to ¥200,000 of credit using the system. 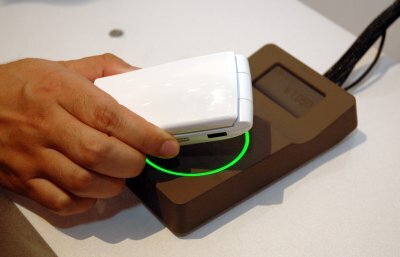 The system relies on a non-contact smart card platform developed by Sony called Felica. Payment is made by placing the phone close to a reader/writer terminal in participating stores. There are already around 60,000 such terminals in place and DoCoMo expects this to more than double by April 2007. DoCoMo is keen to see the system grow as part of its push to reduce its reliance on voice services for revenue, which have ever thinner margins because competition has pushed down prices in the Japanese market. As part of this push it’s rolling the service out to all consumers. On Thursday DoCoMo took the wraps off fourteen 3G cellphones that will be released over the coming months. All of the telephones are Felica-compatible and all come with the necessary software to use DCMX pre-installed. The expansion plan recently got a boost when DoCoMo and three other companies that operate rival payment systems based on the Felica platform agreed to build a common terminal. The terminal will start appearing in shops from January next year. Initially it will accept payments by DoCoMo cellphone and JR East’s Suica system. Later it will be expanded to include BitWallet’s Edy e-money and credit-card issuer JCB’s QuicPay. Payments made using Felica-based systems are on the rise in Japan. JR East counts more than 17 million holders of its Suica card, which was launched in 2001. While many use it exclusively for train travel, the same card can be used in shops in and near railway stations. BitWallet’s Edy service is accepted in 40,000 stores in Japan.